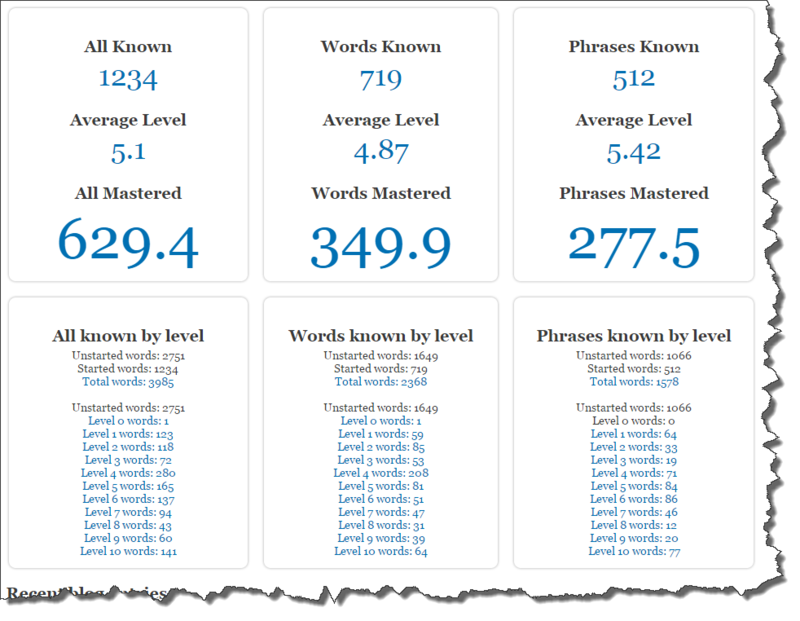 One of the small but powerful changes recently has been the addition of your Mastery Scores and your High Scores at the top of the page whenever you are logged in. 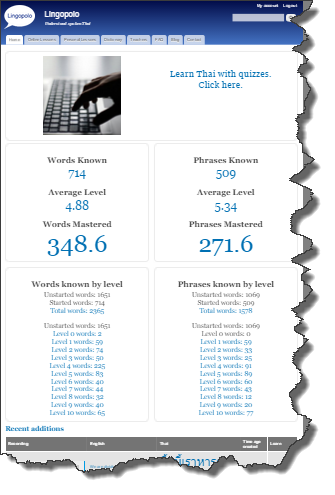 This is a very useful addition to help keep you motivated to improve. 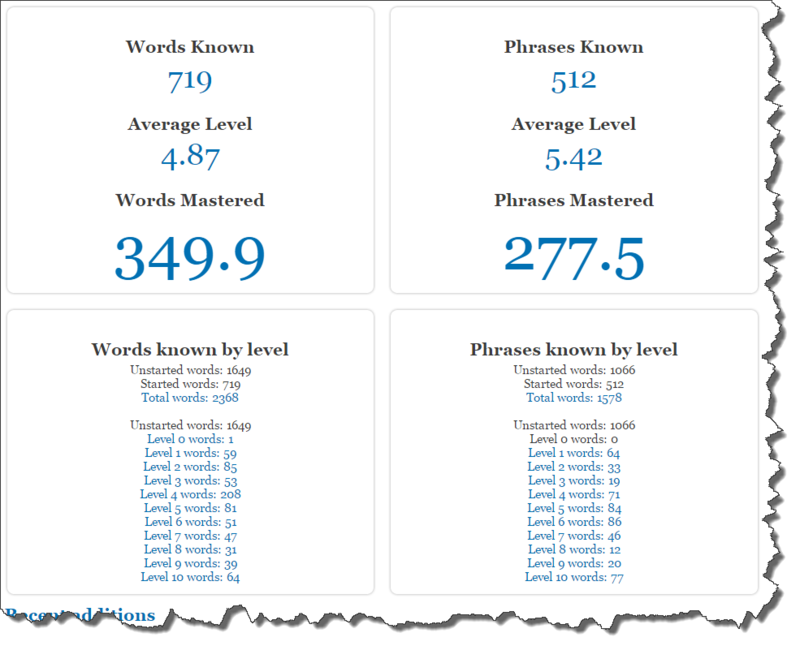 It will show your overall score for Thai, and then that value broken down into the your mastery of words and of phrases. Finally, if you are within a lesson, it will show you what your mastery of that lesson is. Can you beat your high score? I'm very pleased to announce some fantastic new prices for Lingopolo! The 1-year membership drops a stunning 40% to only €4.95 per month (from €99 to €59.40 for 12 months). And the 1-month membership drops an amazing 50% from €19.95 to €9.95. In addition, I'm pleased to announce new 3-months and 6-months membership options. So, if you've been hesitating up until now because of the cost of Lingopolo, there has never been a better time to invest in your language ability. Read more about Fantastic new prices! In the vocabularly lesson you will find just the words on their own. In the examples lesson, you will find all the example phrases which use these words. If you have been using Lingopolo recently, you cannot possibly have missed the latest addition: gorgeous, beautiful, stunning, funny, lovely photos! I am very pleased to announce that lessons are now directly accessible from their related words, phrases and dialogues. I'm very pleased to announce the addition of a Thai-English dictionary, together with many other dictionary improvements. Firstly, the Thai-English dictionary. This is something which I've had in mind to add for a very long time, every since the creating the English-Thai dictionary. It's now available and, as a student of Thai myself, I find it very interesting to look at an alphabetic list of words all beginning with the same letter. I am pleased to announce that Lingopolo is now mobile friendly. Yes, it was microscopically tiny text. Now over 4000 Thai recordings! I am pleased to announce that we now have over 4000 Thai recordings! 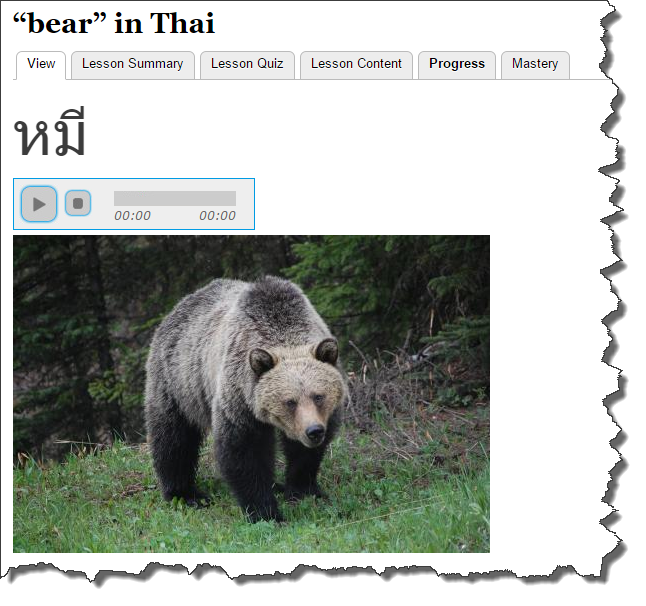 Read more about Now over 4000 Thai recordings!